This was a substantial and wide-ranging auction that required four selling sessions, commencing with the ever-popular section of Miscellaneous & Mixed Lots, followed by an unusual collection of British West Indies covers formed by the late Dr Eric M. Bateson of Queensland that presented an exceptional range of issues and varieties rarely found on cover. The Antigua 1884 1d. 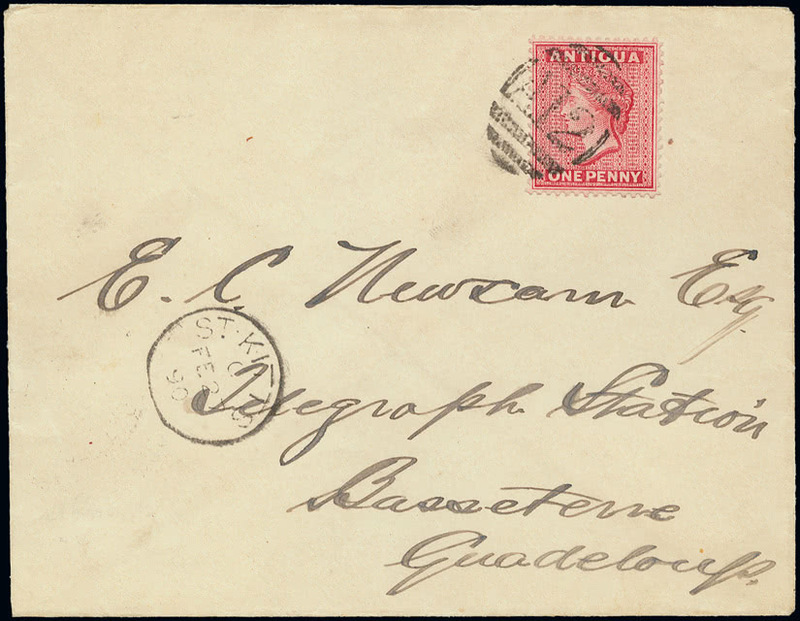 carmine-red on an 1890 envelope sent from Saint Kitts to Guadeloupe (lot 89) was bid to £940, whilst British Guiana was popular with a strip of four of the 1882 type-set issue 1c. magenta including one with foot to “1”, used on a local cover from 1882 (lot 152) rising to £652. 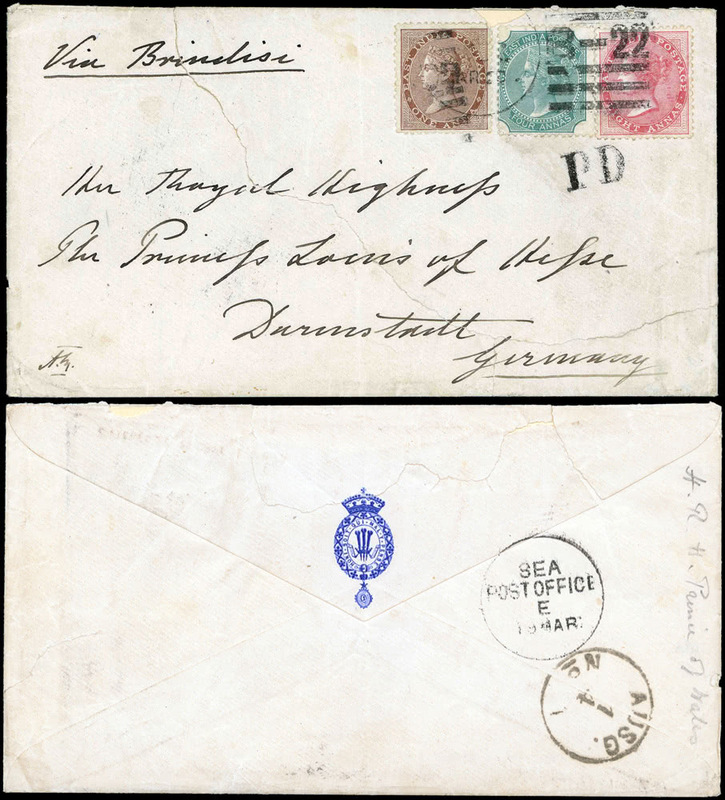 One item that attractively combined philatelic and historic significance was the envelope sent by the future King Edward VII from Aden in 1876 to his mother-in law, Princess Louise of Hesse-Kassel bearing Indian adhesives in three colours (lot 273) that sold for £959 in spite of some defects. 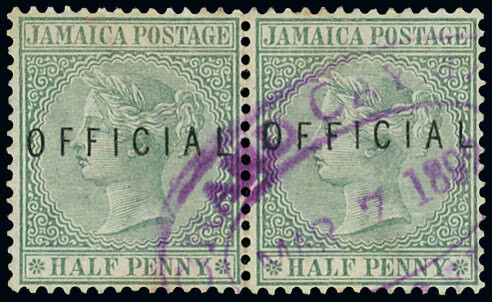 A horizontal pair of the Jamaica 1890-94 Official 1/2d green used in the Cayman Islands with part “GRAND CAYMAN/ MAR 7 1892/POST OFFICE” oval datestamp in violet (lot 615, left) achieved £2,164, this being the only known multiple of this stamp. An appealing mint example of the Niger Coast 1893 10/- on 5d. 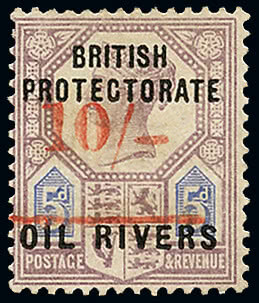 (lot 1278) realised a creditable £3,612. Specialised collections created by collectors can represent hundreds, sometimes many hundreds, of hours of personal research coupled with the diligent pursuit of scarce items. Suitable studies of a comprehensive and handsome nature may sometimes benefit from being offered intact. One such in this auction was a particularly fine display collection of the U.S.A. 1861-68 2c. Andrew Jackson issue (lot 1870) which found a new home for £5,265. On the second afternoon the sale came to a conclusion with a further specialised section of Falkland Islands & Antarctica that included fine material from the collection of Dr Carlos Garcia-Moral of the U.S.A. This was a particularly well-attended session that attracted many members of the FIPSG (Falkland Islands Philatelic Study Group), a meeting of the Group being held in the saleroom following the auction. This knowledgeable and sociable band of collectors contributed greatly to an enjoyable afternoon that provided many interesting results. It was noted that Queen Elizabeth II varieties continue to strengthen. 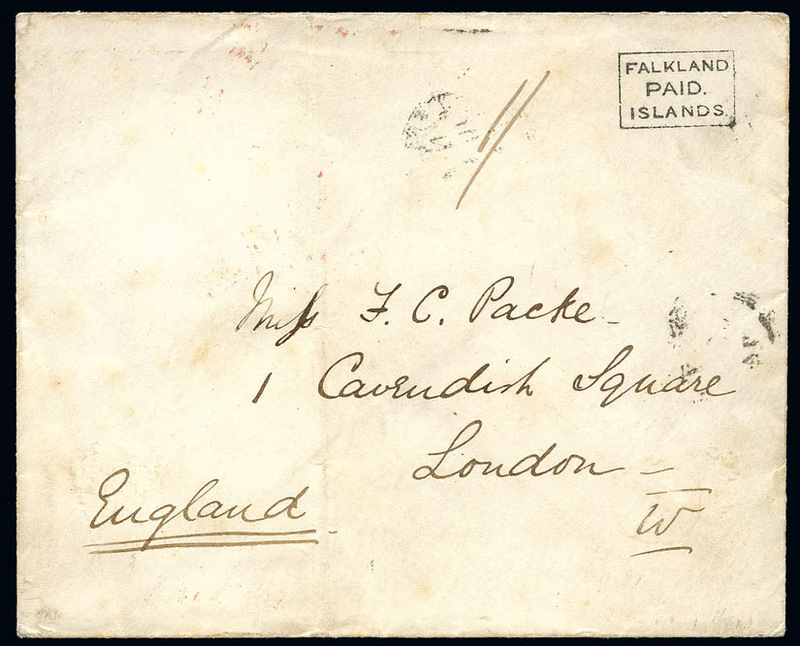 The Red and Black Frank covers, in use before stamps became available, are the ‘aristocrats’ of Falklands postal history and rarely disappoint. A fine example of the Black Frank (lot 1899, left), sent at double rate to London in 1874, here sold for £8,190. 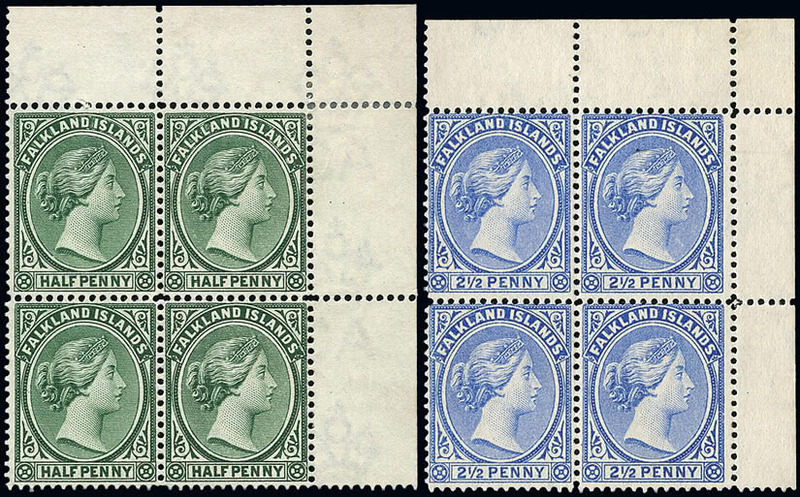 Matching blocks of four of the 1891 1/2d. and 21/2d. 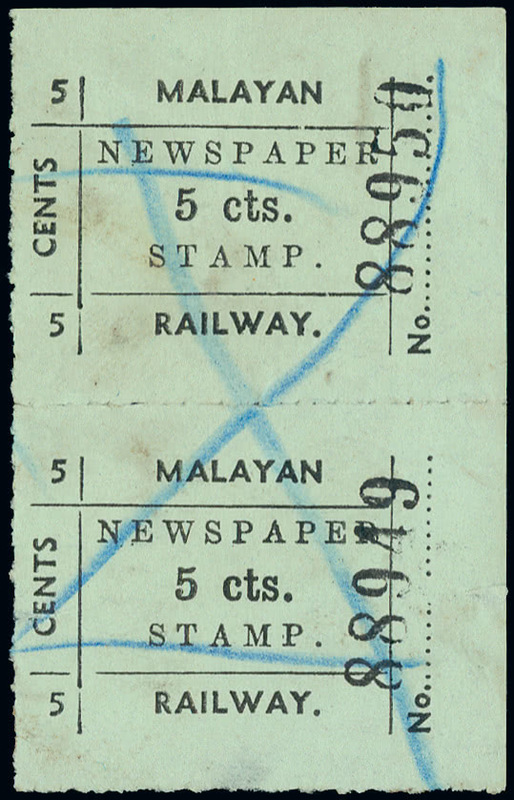 first printings (lot 1920) achieved a strong £4,575. These rare blocks originated from the Bradbury Wilkinson archive sheets, these being the only source for these attractive shades as the issued stamps sent to the islands were lost in the sinking of the steamer Neko. Another rarity, one of just two known examples, was the 1924 1d. 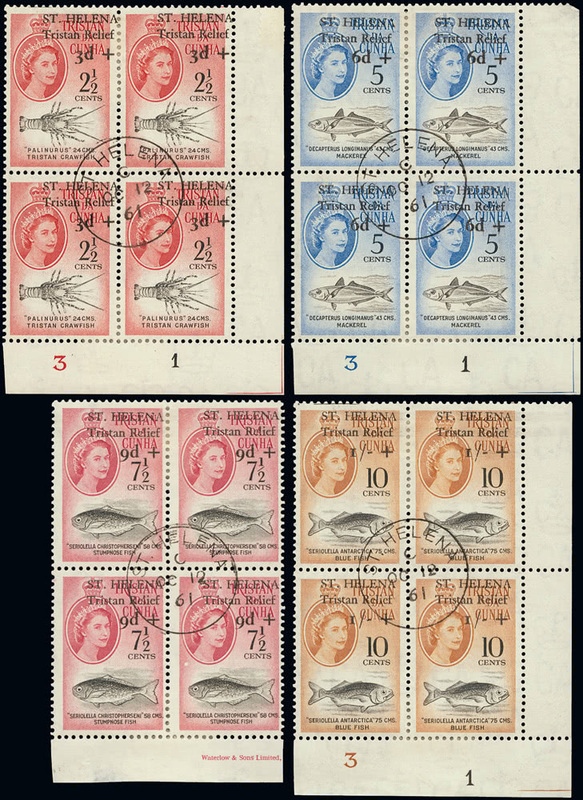 dull vermilion (lot 1993) with watermark inverted (but not reversed) which exceeded both its Stefan Heijtz and Stanley Gibbons catalogue values by selling for £4,214. 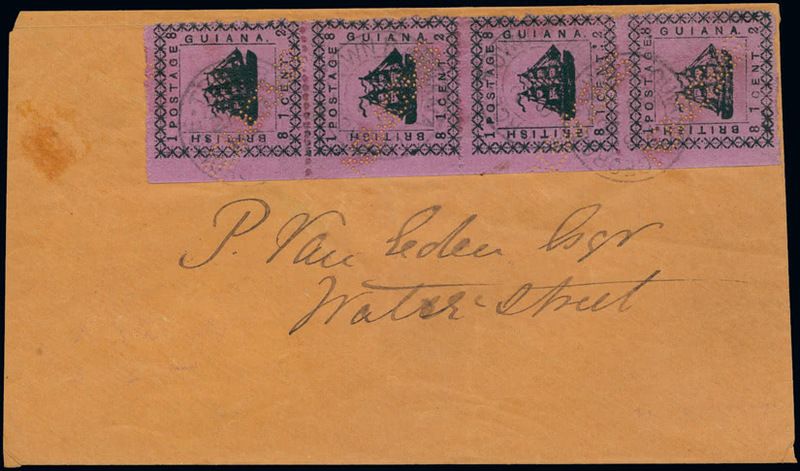 Condition is all in the philatelic world and premiums paid for items seen to be of an exceptional nature can sometimes be striking. A perfect illustration of this was the £3,444 paid for a superb unmounted mint example of the 1933 Centenary 5s. black and yellow-orange with lower margin (lot 2020, above, S.G. catalogue value £2,500) whilst a more ‘normal’ mint copy (lot 2021) achieved £1,317. The Trevor Barnes collection of South Georgia was very well received and, amongst an interesting group of whaling mail, bidding for a scarce picture postcard of the slipway at Grytviken sent to the Netherlands from this remote island in 1914 (lot 2264) rose to an impressive £1,108. Prices quoted include buyer’s premium and taxes. Due to increasing costs and to protect the high quality of service at Grosvenor the decision has been taken to increase the buyer’s premium from 17% to 19% from 1 January 2014.